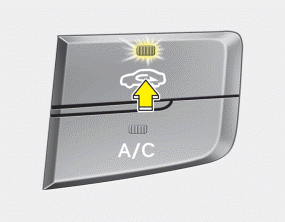 Continue using the climate control system in the recirculated air position may allow humidity to increase inside the vehicle which may fog the glass and obscure visibility. Continue using the climate control system in the recirculated air position can cause drowsiness or sleepiness, and loss of vehicle control. Set the air intake control to the outside (fresh) air position as much as possible while driving.